With today’s generation Z having so much on their plate, a place to call their own is of the utmost importance. Today, your teens need a good night’s rest, a space to work on projects and an area to showcase their individuality. Young VOX is a range of contemporary furniture that spans across our collections and has been specially made with the teenager in mind. 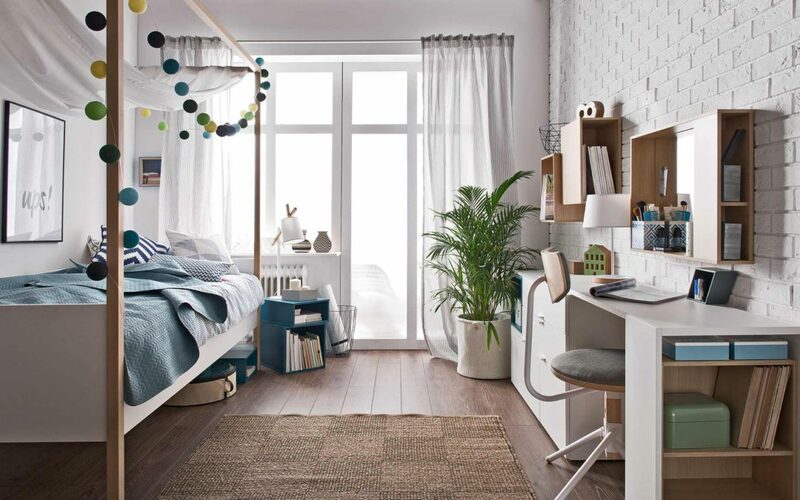 This week, we take a look at the 4You teen bedroom. It’s been a hard day at school and your teenager is in the midst of a pubescent mood swing – we have all been there, we were all teens once upon a 90’s dungaree. With this in mind, we know how important having our own space was under these type of circumstances. When frustration strikes, a calm and serene space is essential for our teen’s well-being. This is what the designers behind Young VOX’s 4You range had in mind. When you look at the image above, what springs to mind? Certainly the words “dreamy”, “airy” and “comfortable” we’d say. Besides the mood-swings, your teen is probably in the midst of a growth spurt; so a little extra-length goes a long way. The dreamy 4You Canopy Bed offers comes in extra-length for your growing teen, giving them a peaceful night’s rest. The bed’s canopy spans 207.5 cm’s in height; giving the bed it’s airy look. This gives your teen so much room to breathe. The design allows your teen to add decorative elements to the canopy of the bed, allowing them to express their individuality. The bed can be placed firmly on the ground for an earthy look and feel or raised from the floor for added storage space. The 4You Storage Drawer (which has been designed for the canopy bed) can be purchased for neat storage below the bed. For a unique alternative to your run-of-the-mill nightstands, the 4You Storage Boxes can be used to create a stacked look next to the bed by using the large and small boxes as a combo unit as shown above. The storage boxes are deep and can carry anything from large books to their smallest keepsakes. It is available in teal, oak, and grey. Notice the beautiful contemporary VOX Muse Floor Lamp. Designed to bring cohesion into your teen’s space. Look at how beautiful the lamp goes with the 4You Canopy Bed. With teens having massive workloads these days, a workable area to study combined with ample storage space is important. What Young VOX brings is the 4You Dresser/Desk with Low Chest of Drawers combo unit. With this, your teens will have enough shelving space to store all their school books and a good amount of surface area for them to study and deliver on projects. The 4You Low Chest Of Drawers also offers ample space to store clothes and other keepsakes. This is definitely a clean-lined look that will have them keep their space well organised and delivering their best work. Watch how it all works below. What do you think of the Young VOX 4You Collection? Let us know by commenting below. Like us on Facebook and sign up to our newsletter to be the first to know about new products and special offers. Follow us on Instagram @VoxFurnitureSA and get inspired.